Digging through bowls and pots and pans is not fun when you need to find that one specific item. 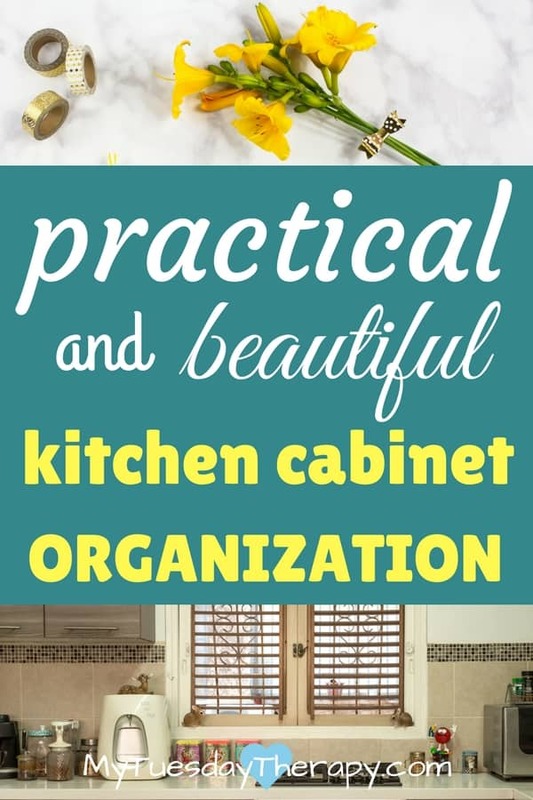 By organizing your kitchen cabinets you can avoid the problem. These pretty and functional ideas will make it a joy to work in the kitchen again! 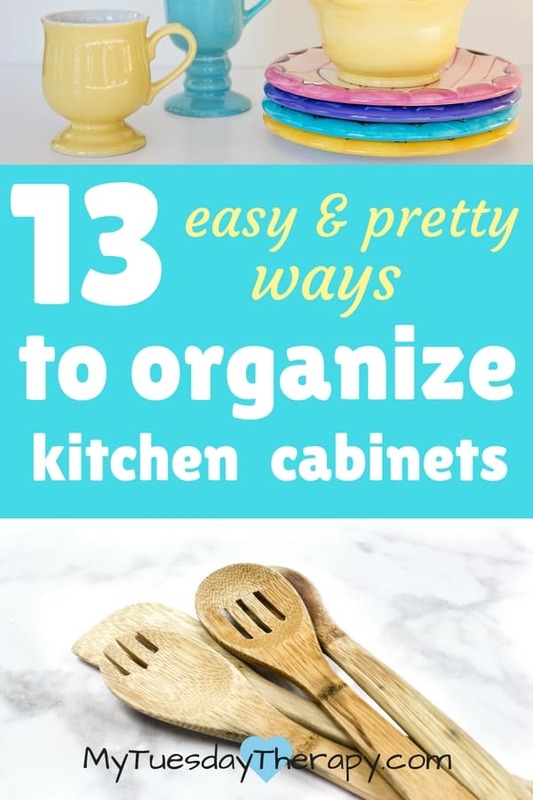 And I think you would also like these DIY Dollar Store Kitchen Hacks. 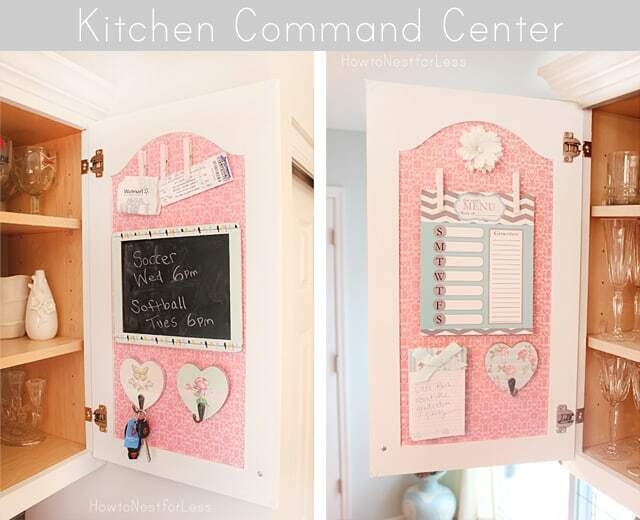 Just wait till you see the adorable kitchen command center! Store based on usage. This one tip is going to help a lot. Put in the easy to reach places items that you use on a regular basis. Yay! Store in the back or somewhere else the things that get used seldom or perhaps only once a year. If you have small kids, it is helpful that the items they can use by themselves are within their reach. That was a time saver for me! An organized junk drawer. If you have a junk drawer what happens. It gets filled up with junk. If you need one buy some cute baskets from dollar store and label them so that all that stuff goes into its assigned place. 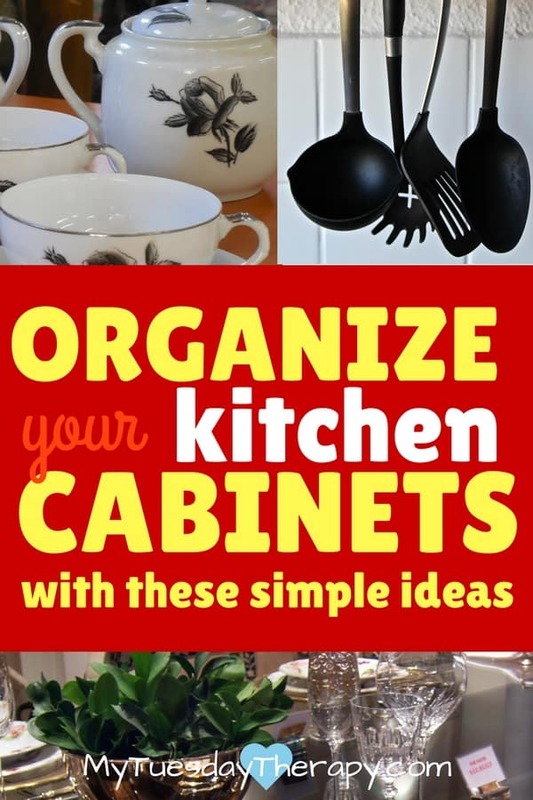 What a great way to use the cabinet doors! Hooks for cooking utensils and little baskets for spices! This kitchen cabinet hack is from Jenna Burger | Sasinteriors. She has an awesome step-by-step tutorial for making this. Not exactly something you would put in the cabinet but this would free up some space in it. It would also utilize the small spaces in the kitchen that otherwise would go unused. 4 Tier Storage Car is quite versatile and it also looks nice. It could give the extra shelving you need in the pantry too. Or use it to serve snacks at a party!… in a place where it can’t be knocked over… and when you have guests who would not use it as a climbing wall. It makes the baking experience so much more pleasant when you want to bake something and everything you need is right there. As you can see the hooks can also be used for the mixer accessories. Idea from Two Twenty One. Pots and pans in a big pile is not the easiest nor the most functional way to store them. Stack your pans with this handy Heavy Duty Pan Organizer! Each pan has its own place and you can take it out and put it back in without moving all the pans. 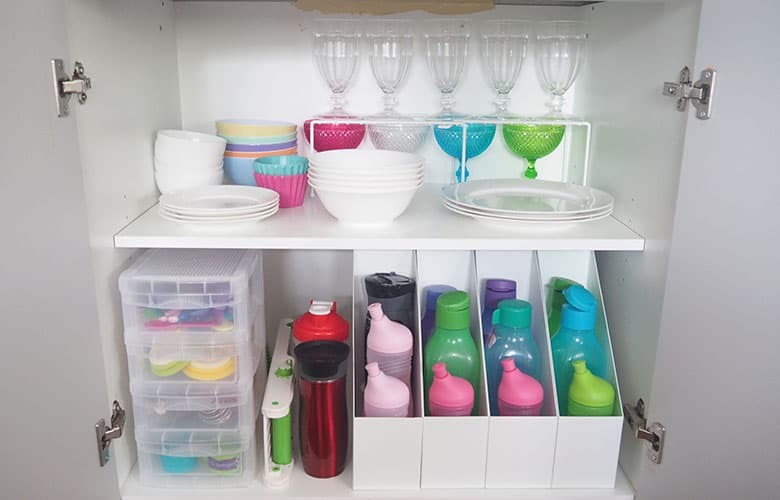 If you have a large collection of sippy cups, water and thermos bottles like so many of us do then this idea from Organized Housewife will surely delight you. No more knocked over bottles all over the cabinet. Maybe you could have a magazine file bottle holder for each family member so everyone can quickly find theirs. Also storing all kinds of tiny items in the little drawer set is a great idea. Those things seem to always get lost or put in random containers. Use a steel desktop organizer to hold all your baking sheets and cooling racks! This makes it so much easier to grab the item you need and it looks pretty neat too. If you are a tea love and enjoy the convenience of teabags then this is a Tea Stand for you! You can use this for any small snack items too! What I like about it is that those little pins (12 of them) are removable. This is not only genius but absolutely adorable. You can find the amazing tutorial at How to Nest for Less so you can make this to be exactly your style and fit your kitchen perfectly! Kitchen command center is a great way to keep everyone up-to-date on what is going on. It’s nice to have a menu right there so whoever is at home can cook it… right? You could also include there a running list of things to buy. That way family members can write down what they need. When it is time to prepare a shopping list you can pull the needed items from that list. 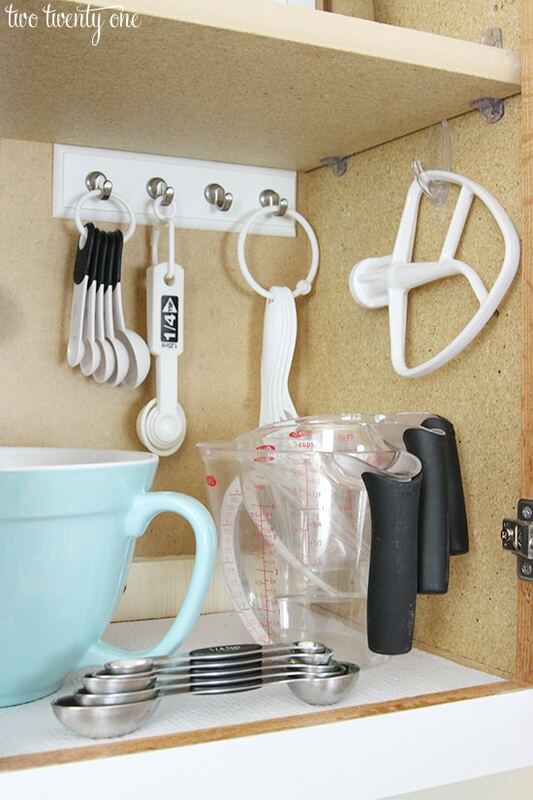 These magnetic hooks also free up space in your cabinets. They each can hold 30lb! You can even use them to hang up your pots and pans. Why don’t these come as standard! I wish I had thought of all this when we had our house built. Luckily they are not too difficult to add later on. 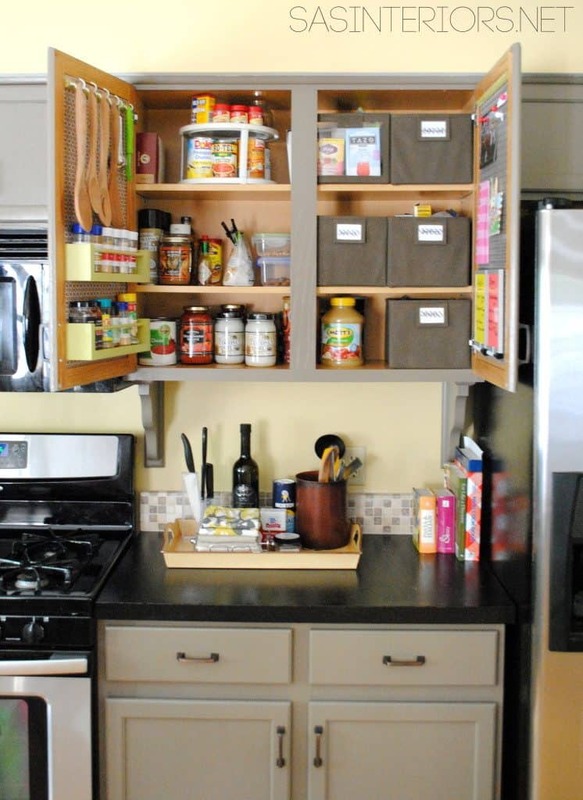 Rev-A-Shelf comes in 4 sizes so you can make all your lower cabinets user friendly. Cookbooks can take up a lot of valuable space. 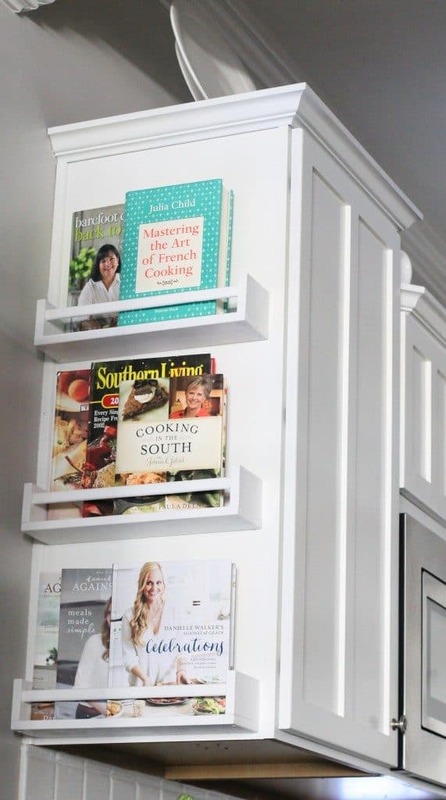 Save your counter and cabinet room and place your cookbooks on these pretty racks. At least showcase you nice looking cookbooks. Some of them can get messy in use. Use baskets to keep plastic containers and lids in order. Searching for the matching lid and container can be quite annoying. Keep them organized with these awesome baskets. What is really great about these is that the set includes more than one size and you can get them in various colors! Besides storing the odds and ends in these baskets they also provide a nice way to keep the cracker boxes or canned goods organized. 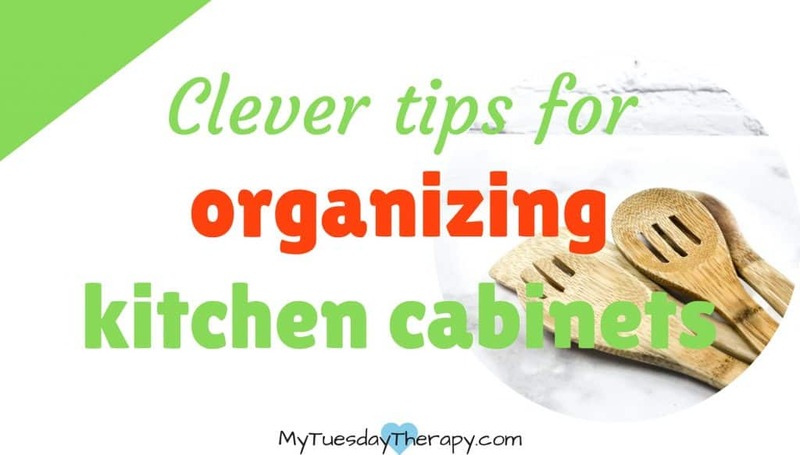 Use baskets to store items on top of the kitchen cabinets too. The baskets have sturdy stainless steel handles so they can be moved around with ease. 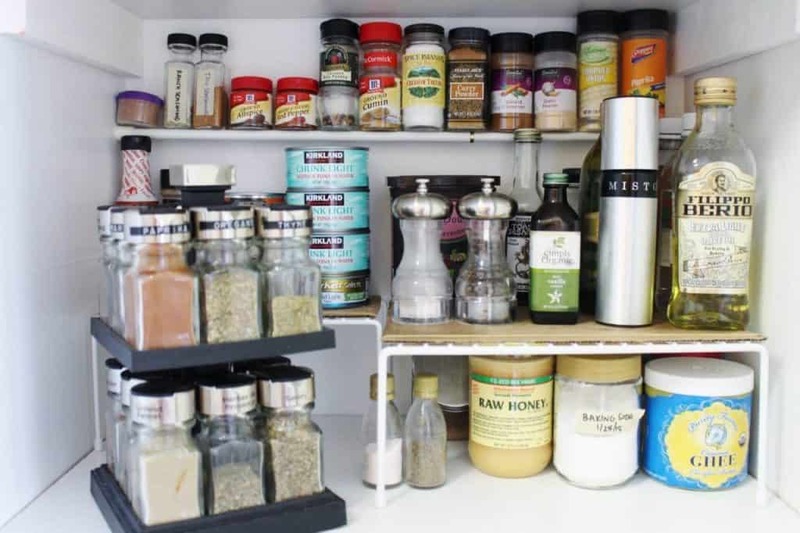 You will love this practical Spice Organizer! You can fit 30 full size spice jars in it! This one actually comes in four different sizes. So if you have a narrow space or not so many spices get the smaller size. It is non-skid so you don’t need to worry about pulling it out of the cabinet when grabbing your spices. This is gorgeous! A beautiful way to store and display your dishes. 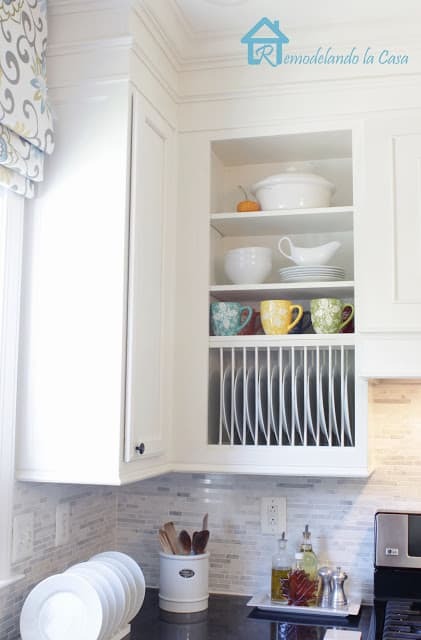 With the awesome tutorial from Remodelando la Casa you will have this lovely plate rack in your kitchen! It will require some skill but it is always good to learn something new. Notice also the cute way to store cooking utensils, oils and spices! And there is a little plate rack too. I like the tension rod idea for spices. A clever way to use the top part of a cabinet and it won’t cost a lot either. This idea is from Crafty Coin. She also has a great way to store the grocery store plastic bags: in a tissue box! Lawn Games for the Whole Family!